The year 2017 has been a doozy. Columnist Nicole Brodeur looks back, story by story, and lesson by lesson. This year started with so much anxiety, I just needed to do something with my hands. 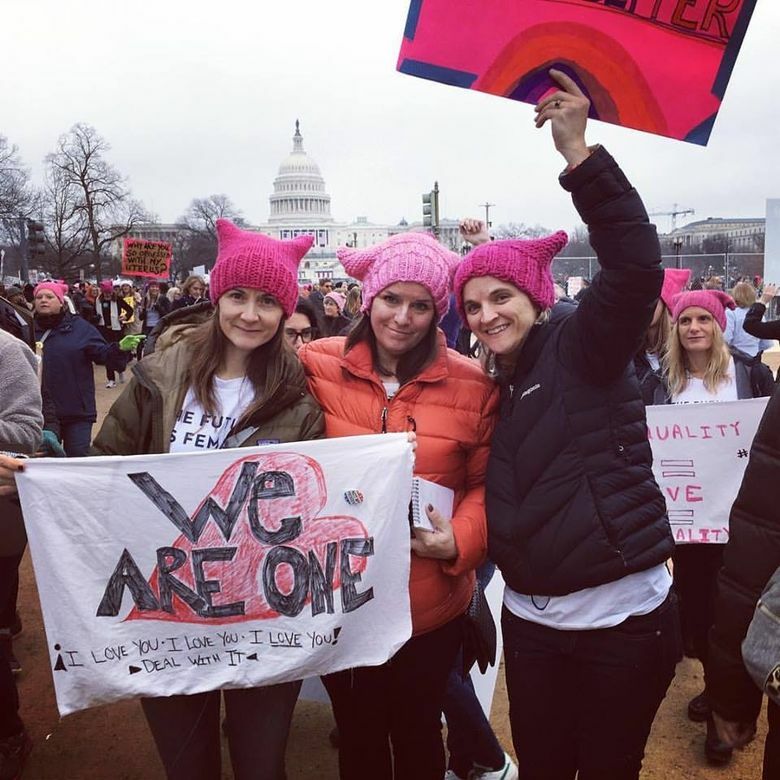 So I knitted a half-dozen pussyhats and flew across the country to try to walk it off at the Women’s March on Washington, D.C.
By year’s end, we were witness to another kind of march altogether: That of men who had sexually harassed or assaulted women walking out of boardrooms and network offices, restaurant kitchens and even the U.S. Congress. I interviewed two of those men this year — a year in which I lamented, learned and hopefully enlightened not just myself, but readers. Actor Jeffrey Tambor, whom we so loved in “Transparent” and “Arrested Development,” came to Seattle’s Town Hall in May to talk about his new book, “Are You Anybody?” He was funny and charming and, according to reports, awful to the women who worked with him. He quit “Transparent,” and the fate of that wonderful show is unclear. Senator Al Franken packed the house the following month when he came to support his book, “Giant of the Senate.” He was the voice of reason, the politician who heard what the rest of us were screaming into the wind, and got it into the Congressional Record. As the #MeToo movement picked up steam, there emerged a photo of Franken pretending to grab a sleeping woman’s breasts. More accusations came, and on Dec. 7 Franken announced that he would resign his Senate seat. There were other hard lessons — one of the hardest was my own. After gang members exchanged 43 rounds on the crowded streets of Columbia City, I wrote a column saying that the neighborhood was torn between the old and the new. It angered people who felt it contained ignorance and racist slights, and that I ignored the deep and committed community that had been there long before businesses like Pagliacci Pizza and Rudy’s Barbershop. So I wrote an apology, dug anew into the neighborhood where I’ve lived for 12 years and made a pledge to explore my own biases. I’m grateful to everyone who weighed in. There were other, lighter lessons — things I did so readers didn’t have to. I also tried out for Jeopardy! when it came to Seattle — and tanked. But in the process, I learned that contestants aren’t in it for the money, that some forget to eat (“We had a fainter,” show staffer Kelly Miyahara told me) and that Ken Jennings almost put a $2.5 million check through the wash. I also learned that I don’t really need an Amazon Echo, even though I got a great deal on one on Amazon Prime Day. I plugged it in, only to hear Alexa say “Welcome,” as if I was the one who just came out of a box, and not her. She’s still around. And listening. So she probably heard the dinner guests who came to my house and asked me if I was interested in selling it. It was the first of a flurry of asks that illustrated how crazy Seattle housing market has become. The city’s growth has also meant the loss of longtime buildings — many of them chronicled by Cynthia Brothers on “Vanishing Seattle,” a website, Instagram and Facebook account that all feature buildings gone — or about to be. The Old Spaghetti Factory. Inay’s Asian Pacific Cuisine. Any number of apartment buildings and houses. “There’s a certain element of nostalgia, which is a way to bring people in,” she said. “But there is also social and economic equity. Those divides are becoming more and more stark, and people can see that. In Greenwood, one group of neighbors valued a tree that had stood on their street for more than 100 years. After the home on the same lot was sold, the tree was slated for removal. But the neighbors fought with all they had — including new blueprints that showed how to save the tree. In the end, another developer stepped in with plans, and money of his own. At this writing, the tree will see Christmas. More than trees, though, Seattle is made up of people who spend their everyday lives making true connections — and in turn, making the city what it is. There was Wendy McNerthney, the longest-serving nurse at the Bailey-Boushay House in Seattle’s Madison Valley, who retired earlier this year. She spent 24 years caring for patients, most of them dying of AIDS. “Treasure life, treasure life,” she told me, when I asked what she had learned. “I feel so blessed that I could do this work, that I could help people who needed it. And then there was Tom Goessman, who was beloved by the members of the Costco on Fourth Avenue in Seattle. He would estimate your total before looking at your receipt, often coming within $10. He was a constant, a character and when he disappeared from the doorway, people missed him. I found out that he had moved to Arizona to better deal with the polio-related infections that flared up in Seattle’s wet and cold winters. The response was overwhelming. People wrote in with hundreds of memories of their 15-second encounters with Goessman. As 2017 closed, I wrote a column about how “feminism” had been named the word of the year by Merriam Webster. It was the most-searched word; an increase of 70 percent over last year’s searches. So maybe all that knitting and marching made an impact. People are curious. They want to learn. And that seems the best way to enter 2018 — with an open mind and a heart that knows what matters.